Tips to arrive feeling refreshed and ready to explore. The prospect of a long haul flight had me thinking of the beauty essentials I’d need to make the experience as smooth as possible. And this list did not fail me! I arrived feeling rested and refreshed and ready to explore Sydney. 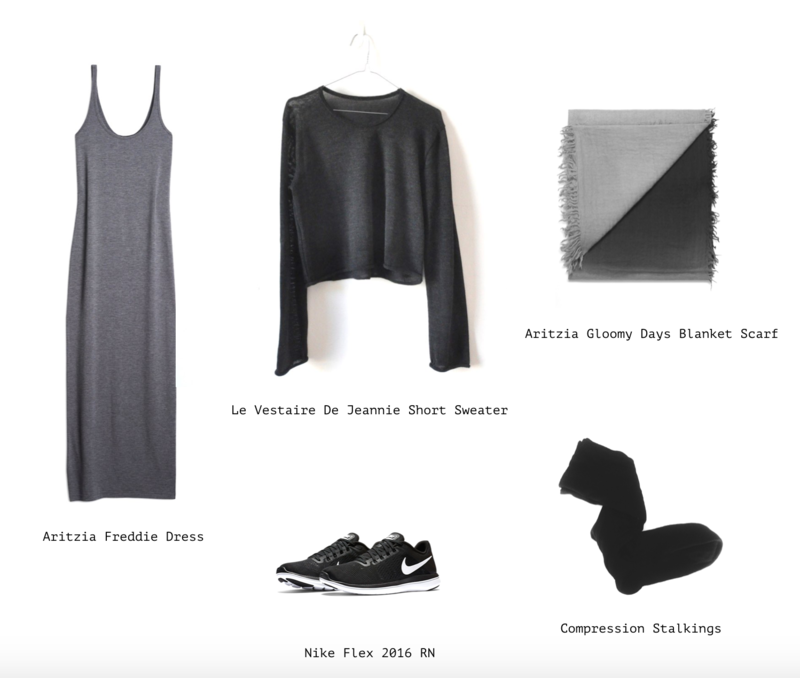 What to wear for the flight. 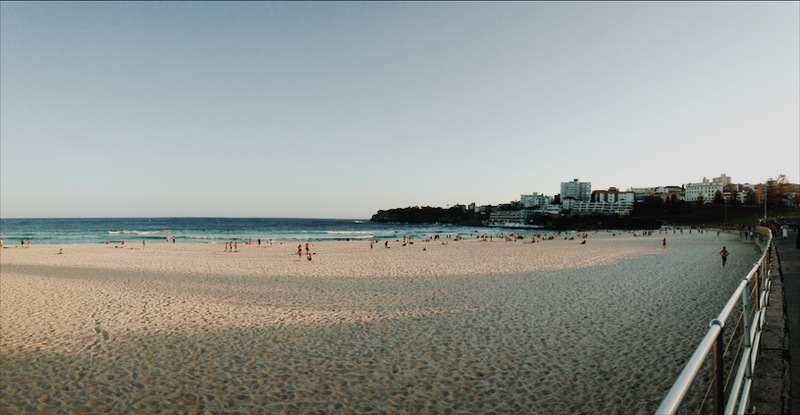 I chose to wear light layers to transition from Vancouver’s winter into Sydney’s summer. It was a cinch to throw my light jacket, scarf and sweater into my carry-on when I landed. The blanket scarf came in very handy to keep me cozy on the plane. I cannot stress enough how great the compression stalkings were! They may not look like much, but you’ll avoid heavy, tired and restless legs by wearing them. You won’t regret it. Just remeber to pack a pair of ankle socks to change into once the plane lands. What to pack for the plane. TIP: Add a drop of Tata Harper’s Moisture Mask to your moisturizer. The avocado esters and hyaluronic acid will help your skin to retain some hydration which will be sorely lacking once up in the air. Eye pillow – this is essential to block out any ambient light so you can catch some zzz’s. Travel pillow – I have a camping pillow that stowed easily into my carry-on. The only downside to this versus the traditional airplane neck pillow is it only works if you pick the window seat (which is my preference). Tata Harper Aromatic Stress Treatment – this is my favourite blend from Tata Harper, but her Bedtime Treatment would also be a good option. Aromatherapy is such a great way to instill calm and the antibacterial benefits ward off any potential bugs in the recycled plane air. Melantonin + Gravol – with this combo I was out for the count and got a decent amount of sleep. TIP: Once past security buy yourself a couple of litres of water so you can hydrate at your leisure. When you’ve had your fill of sleep, head to the washroom and spritz yourself with the Caudalie Beauty Elixir. Freshen up with a quick toothbrushing and throw on a little Tata Harper Be True lip treatment to keep your lips plumped and moisturized. 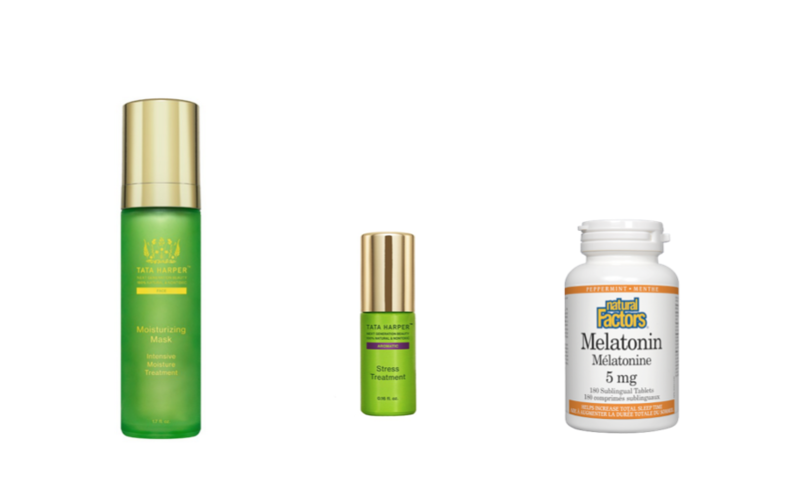 When you hit land, make sure to protect your skin from the sun with these SPF must-haves. 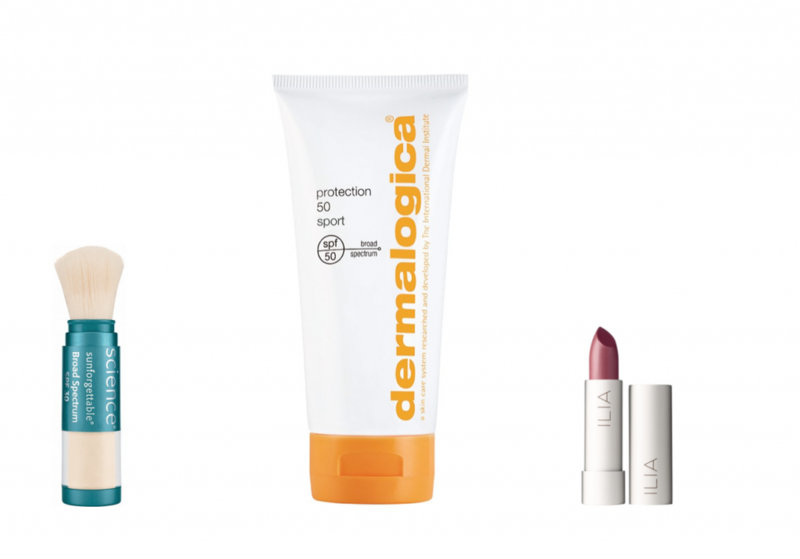 Body – Dermalogica Protection Sport SPF 50. Pack a travel size in your carry on to lather up when you land. This brush on sunscreen (pictured far left) is something I never leave home without. A few quick swirls of the brush weightlessly protects your skin. It’s also great way to get sun protection for your hairline and part. And don’t forget your lips! I love the hint of colour this lip conditioner from Ilia imbues (pictured far right)–it’s the perfect pick-me-up after a long flight. Mask – On your first night, give your skin a good cleanse and follow-up with a mask to purify and balance. 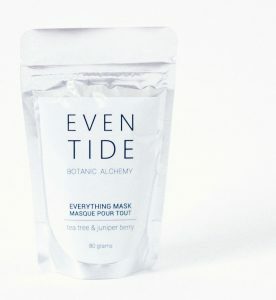 The Eventide Everything Mask is the perfect combination with white clay, oats and rose petals to detoxify, soothe and hydrate a tired complexion. I found doing a little extra planning for the flight made all the difference. The time went by so quickly and I didn’t have any issues with jet-lag. I’d love to hear from you if you have any travel beauty tips to share, leave them for me in the comments below!